Snorkeling is a great way to immerse yourself in the wonders of our oceans. It’s an underwater experience using a breathing mask called a snorkel, that allows the swimmer to stay underwater for extended periods of time. 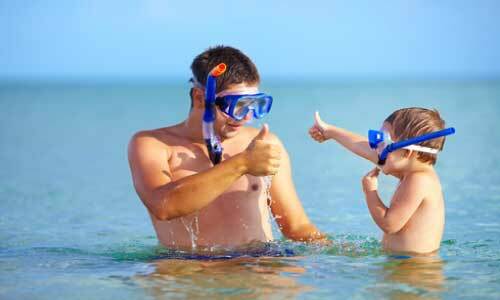 Snorkeling is a simple and fun activity that can be enjoyed by everyone, young or old. It’s by far the easiest water sport to learn and requires little gear or any prior training. Snorkeling is more than just an activity to do on your family vacation, it’s an exciting experience that offers limitless possibilities for exploration! Snorkeling is a great activity for the whole family… even for grandpa and grandma. It’s simple, fun, and requires very few skills. All you’re required to know for snorkeling is how to swim and feel comfortable in the water. If your grandma can do both, she too can get in on the fun! Snorkeling requires very little equipment. All you need to snorkel is a mask, a snorkel, and a pair of fins. This equipment is relatively cheap, making it an affordable activity for all. Snorkeling is almost entirely risk-free. The danger level of snorkeling is no higher than if you were to take a regular dip in the ocean. As I said before, all you need is to know how to swim and be able to breathe through a tube. If you can manage to do these things, you’ll be just fine! Unlike scuba diving, which requires hours of training beforehand, snorkeling requires absolutely no training. If you’ve successfully gone for a swim in the past, you’re completely trained. Snorkeling is usually done as a leisurely activity on vacation, but that’s not all it is. Snorkeling is also a sport. When you kick your fins, your heart rate increases, you burn calories, work your abdominal muscles, and tone your legs. From the second you enter the water, you’ll be having fun while exercising, and what’s better than getting a workout while having fun? Earth’s oceans cover over 70% of our planet, yet the majority of it is undiscovered. Humans know very little about the world below the water, making exploration that much more exciting. While you won’t be diving deep and discovering entirely new species of fish, you will get the opportunity to see creatures you haven’t seen before. Snorkeling doesn’t require you to wear any clothing specific to snorkeling. You can dress in the same way that you would for your regular beach day. All you need is a swimsuit. It may be a good idea to wear a rash guard to protect you from the sun, but that’s entirely up to you. 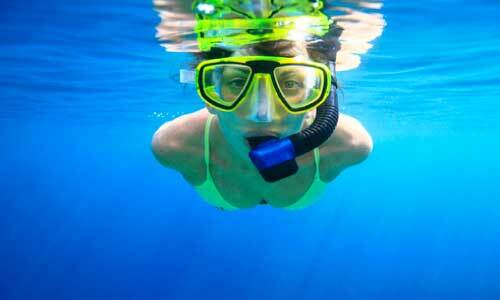 A snorkel is essentially just a curved tube that enables you to breathe with your face underwater. 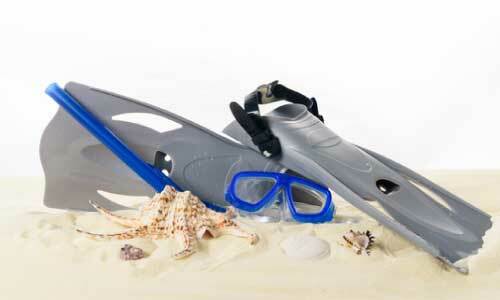 Snorkels are typically shaped like an “L” or a “J” and are made out of plastic or rubber. On one end of the snorkel is the mouthpiece that allows you to breathe. On the other end is a hole that sticks out of the water, through which your air travels to your mouth. There are four popular types of snorkels: snorkels with straight tubes, snorkels with tubes that have purge valves on the bottom, snorkels that have flexible sections close to the mouthpiece, and snorkels with tubes and mouthpieces that are easy to replace. When purchasing a snorkel, it’s most important to choose one that is long, comfortable for your mouth, and easy to clean water out of. It’s also recommended to purchase a snorkel with a wave deflector. This attaches to the top of the tube and reduces the amount of water that enters into it so you don’t swallow water when going under a wave. The mask is the most important equipment for snorkeling, as it allows you to see underwater. When buying a mask, there are a number of things to look out for. By far, the most important thing is to choose a mask that is made specifically for snorkeling or diving. You want to choose a mask with a lens made from impact resistant, shatterproof glass so it can withstand pressure while you swim deeper underwater. Do not purchase one made from plastic, as they cannot withstand high amounts of pressure. Snorkeling masks are either high or low volume, which just refers to the amount of air inside the mask. You should avoid high volume masks because they trap more air inside than necessary. They also sit farther away from your face and create more buoyancy. It’s recommended to purchase a low volume mask. These masks are easier to seal and create less pressure that you have to equalize as you dive deeper into the water. Also, water is easier to remove from these masks if it does happen to seep in. There are a number of different types of lenses. Classic lens – This lens has one large piece of glass. Your nose sits inside the mask. These are high volume and don’t seal well. One lens – This is the most popular type of mask. These have a separate nose pocket and allow you to see forward without obstruction. However, the downside of these masks is that they usually have less room for your nose bridge. Split/two lens – These masks provide more room for a bigger nose bridge and are generally low volume. Three/four lens – These masks add side windows, allowing better peripheral vision and more light to enter. They merely allow you to see motion more naturally. The downside of these is that adding the side windows increases volume. Frameless – These masks don’t have the stiff plastic frame that other masks have– the masks’ silicone skirt is attached directly to the single lens. These are lightweight and low volume, making them a great choice. Fins are also essential for snorkeling. Without them, you won’t be able to swim properly. They protect your feet from scrapes and allow you to tread water more easily, which ultimately saves you energy. When choosing a pair of fins, it’s important to make sure they fit you properly. They should fit snugly on your feet but shouldn’t be too tight. There should not be any hard spots rubbing against your foot, as this will create blisters. One important thing to note, in particular, when choosing a pair of fins is that they’ll be more difficult to put on when your feet are dry. Try not to stress about this too much. Once your feet are wet, they’ll be much easier to get on. There are two main types of heels on fins, closed foot, and open foot. Closed foot fins weigh less than open foot fins, making it easier to move your body in the water. Open foot fins, on the other hand, have a strap around the back of your heel, allowing you to wear a boot in the water. But this is not necessary for snorkeling. Open foot fins can be stiffer, heavier, and bulkier than closed foot fins. The shape of the fin itself can also differ. The two main types of fins are paddle fins and split fins. Paddle fins are the standard type of fins. These allow you to accelerate more quickly and offer good control and maneuverability when swimming near coral. However, your leg strokes in these fins will be long, slow, and powerful, offering less speed than split fins. Split fins are designed to send the water force directly behind you, which propels you forward more easily. Your leg strokes are smaller, easier, and more rapid, allowing you to move forward more easily. The downside of these is that you have less control over your movement in the water because you’re not pushing against it as much. When snorkeling, it’s extremely important for your mask to properly fit your face. Hold the mask up to your face and breathe in through your nose. If the mask seals perfectly and stays in place without holding it, it fits. If air leaks into the mask, it doesn’t fit. Don’t wear the mask too tight– the water should apply enough pressure to secure the mask in place. The strap should feel snug at the widest area towards the top back of your head. If you wear the strap at the base of your head, water will seep in. So, if you find water seeping into your mask while snorkeling, check the placement of the strap, it may be too low. As I said before, your fins should fit snugly on your feet but not too tight. However, if you’re unable to find a pair that fits perfectly, go for the one that’s a little too big rather than too small. Your feet are going to hurt if they’re too small, making swimming a challenge. Before getting in the water, practice breathing through the snorkel. If you’re eager to get into the water, practice breathing in shallow water first to get accustomed to the equipment. It’s also helpful to practice your breathing while floating face down in the water. And when breathing through the tube, refrain from biting the tube. The number one reason why your mask may fog up is that it’s dirty. Moisture attaches to specks of dirt and oils in the mask, causing it to fog up. The simplest way to deal with this is by cleaning it regularly. Apply a small amount of toothpaste onto a toothbrush and scrub the inside of the mask in hot water. Once you’ve washed off all of the toothpaste, be sure not to touch the inside. Another way to avoid fogging is by spraying anti-fog in your mask. Swish the liquid thoroughly around the mask so it covers the entire surface. Do not rub the liquid with your fingers, as they contain oils and dirt. Then, quickly rinse your mask with freshwater or saltwater. Snorkeling in Ambergris Caye is truly a once-in-a-lifetime experience. It is undoubtedly one of the most beautiful snorkeling destinations in the world. This spot is located just one mile away from the untouched, 185-mile long Barrier Reef. It is the second largest reef in the world, just behind the infamous Great Barrier Reef in Australia. Here you’ll see many different types of coral, a wide variety of colorful fish, eels, rays, sea turtles, and if you’re lucky, even nurse sharks. Located halfway between Sao Paulo and Rio de Janeiro, the warm waters off the coast of Ilha Grande are a wonderful place to snorkel. Riddled with shipwrecks from the battles between pirates and the Portuguese, you’ll be swimming between the ruins and through underwater coves with sea horses, turtles, and angelfish. It’s no doubt that all of the Hawaiian Islands have beautiful spots to snorkel. However, the Big Island, in particular, is the best. At the Captain Cook Monument at Kealakekua Bay, you’ll be swimming with dolphins, sea turtles, and colorful fish. At Honaunau Bay, you’ll be able to explore the coral gardens while also swimming alongside dolphins and colorful fish. The crystal blue waters of Palawan in the Philippines are another beautiful snorkeling destination. In Coron, you can swim with schools of fish in the coral gardens and through what’s known as the Skeleton Wreck, a sunken Japanese WWII gunboat that has now become a reef itself. Snorkeling in Palawan is truly an unforgettable experience. 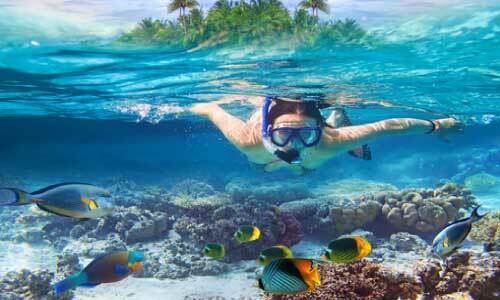 Snorkeling is a fun and exciting activity that requires little equipment and few skills. Whether you’re swimming amongst the sea creatures living at your local beach or exploring unique species in a far away ocean, you’re bound to have a great time. So, next time you want to take a dip in the ocean, grab your snorkel gear and transform your regular swim into an underwater adventure!